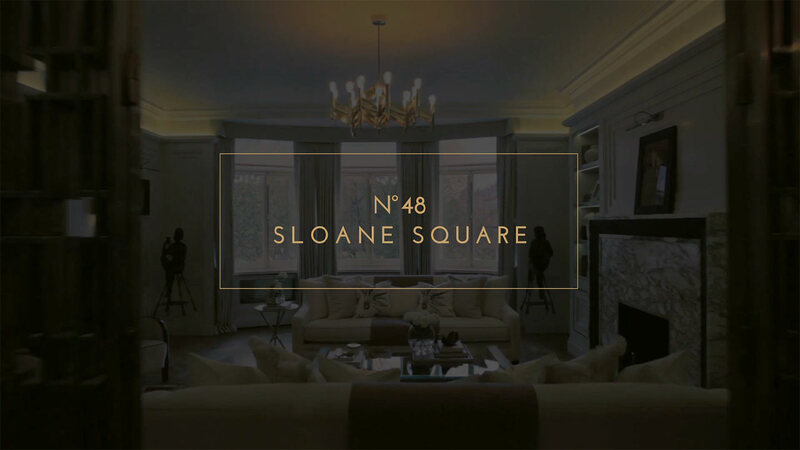 This Sloane Square property, built in 1904, boasts one of London’s best addresses. Today home to many of the world’s best fashion houses, this west facing apartment lies at the heart of the unique estate of the Cadogan family and directly overlooks the square bearing the family name of Sir Hans Sloane, notable for bequeathing his collection of natural history and curiosities to the nation paving the way for the foundation of the British Museum. Natural light welcomes you as you walk through the entrance of the apartment. 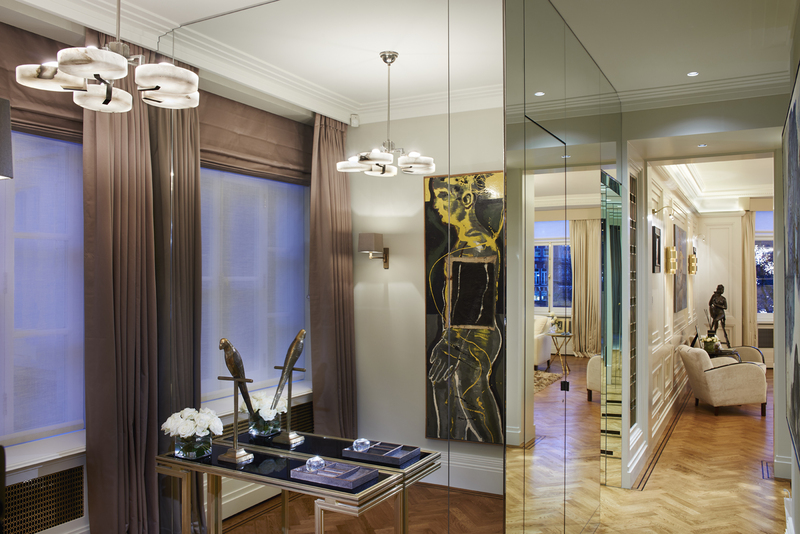 The internal walls are covered in mirrors that, along with the ingenious architectural use of plaster of paris moulded cornices and skirting boards, make the space appear to have multiplied in size and volume. Our mission has been the pursuit of the very best an artist and craftsman is able to produce. The beautiful panelled walls throughout the room create a sense of warmth that inspires you to stand by the windows and gaze as the world goes by. Exceptionally crafted niches with a brushed brass inlay wraps the grand fireplace. At the push of a button the fire invites you to relax and enjoy the serenity. 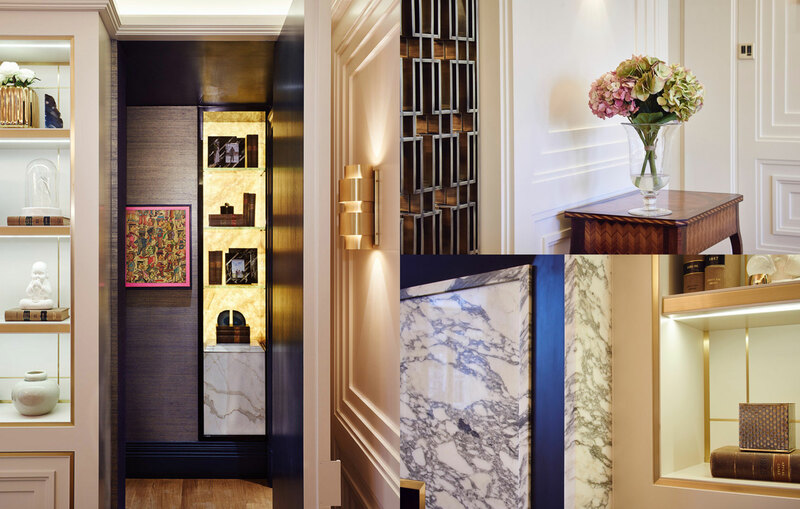 A secret door concealed in the wall panelling reveals access to your guest suites. The beautiful parquet flooring in the original herringbone pattern is simply exquisite. The aged oak wood, treated only with natural oils, gives the silkiest feel when walked on barefoot. 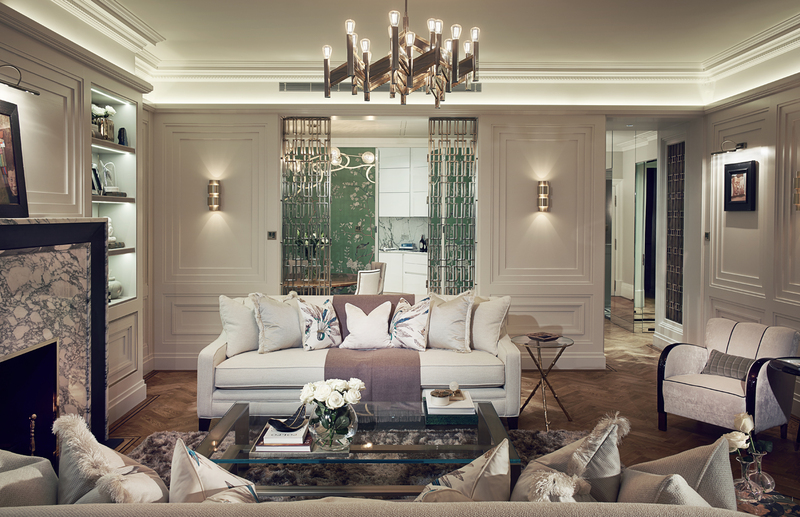 A variety of refined materials have been used and blended together with the greatest of attention to detail. From the timber panelling and marble fireplace to the mahogany panelled doors and the exquisite brass inlays all features have been cut, fitted and finished by hand using the same techniques employed by craftsmen at the turn of the 19th century. The more you study the details, the more you are drawn by the romance of their story. Various monarchs, such as Louis XV of France, gave special favor to chinoiserie, a style of decoration that entered the European repertory in the 17th century. Entire rooms were painted with chinoiserie compositions by renowned artists and others brought expert craftsmanship to the style. The warmth, appeal and feel of the hand made items such as the silk wall covering, the bronze doors and brass chandelier, are the result of the tiny irregularities caused by the human hand striving to achieve perfection. The spirit of the creator is embodied in each and every object. 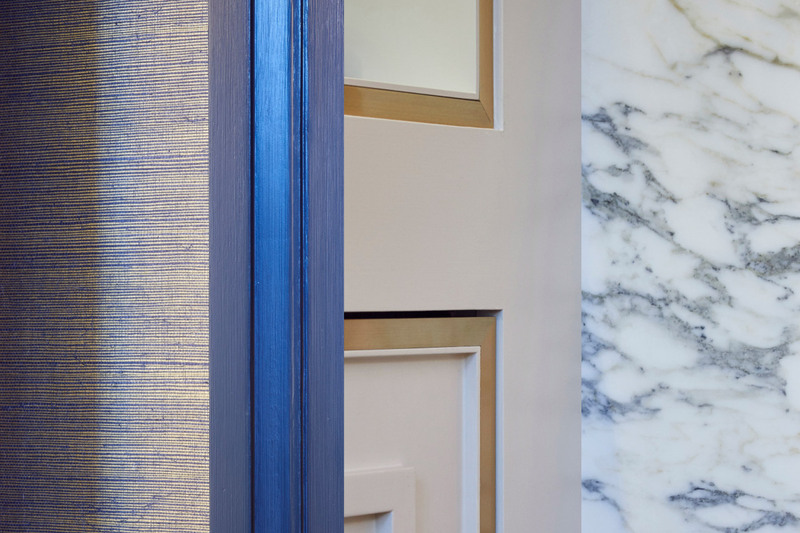 It took in excess of 1,000 hours for an artisan in northern Italy to create the bespoke bronze doors and architectural panels used in the warm and elegant dining room.  Whether open or closed the architectural pattern retains its intended proportions. Despite their weight exceeding one tonne, their operation is precise and effortless. 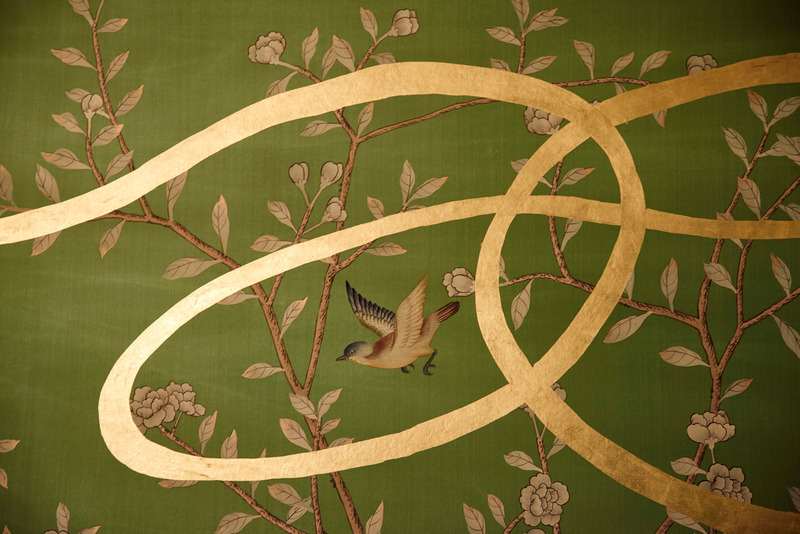 Striking emerald green hand-dyed silk covers the walls of the dining room, taking an artist 18 weeks to paint the motif. 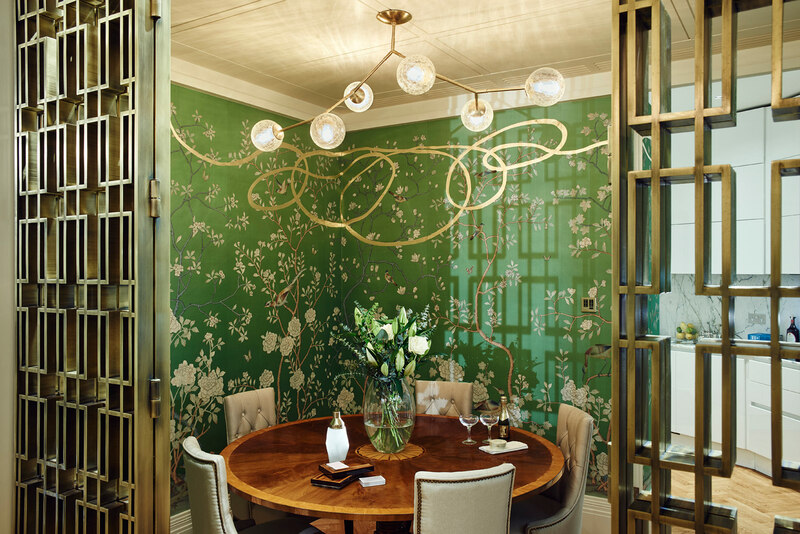 The gold leaf ribbon used in the design could only be hand painted once the silk was applied to the wall, the artist requesting classical music to be played for inspiration.The bespoke brass chandelier that hangs in the room was designed to sit in perfect harmony with the tree branches featured in the scenery. The petite, perfectly sized bar is complemented by a pull out drawer hand wrapped in green nappa leather on which to serve your drinks. 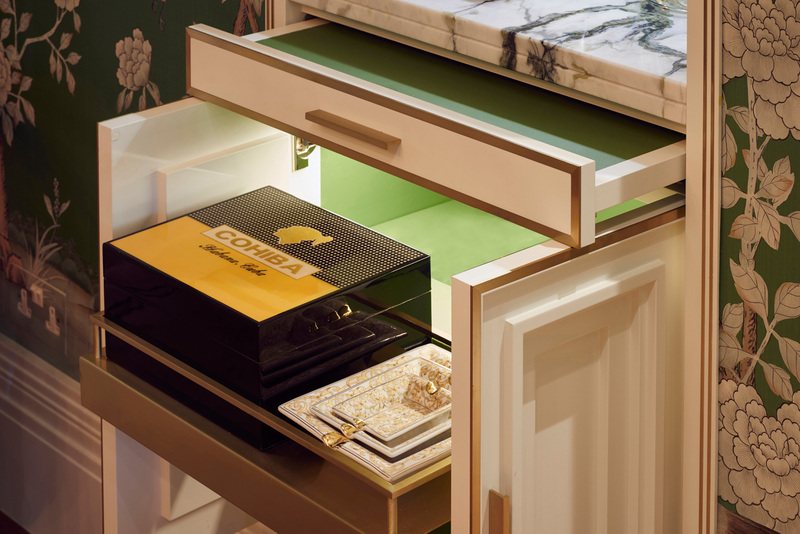 Underneath, you will find beautiful panelled doors that reveal a rather special leather clad cabinet which boasts a smart brass extendable shelf on which to present your cigars. No two bedrooms look alike. Each was designed to offer its own individual feel. All however will provide you with a 6 star experience of luxury, relaxation and touch. Choosing your favourite might prove challenging. The perfect living environment cannot be achieved by simply replicating a page from a magazine. 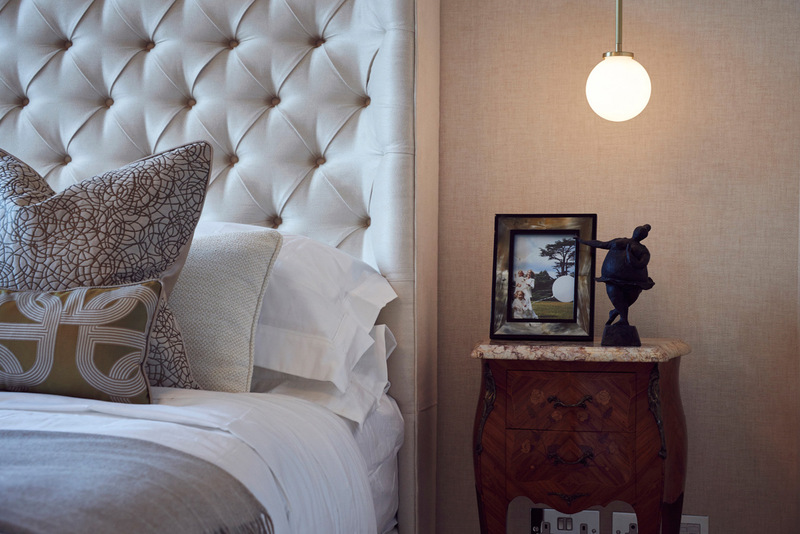 A careful selection of antique and unique pieces were sourced to complement the new designs crafted. The beauty lies in the successful orchestration of all the different pieces. Design is as much about beauty as it is function. 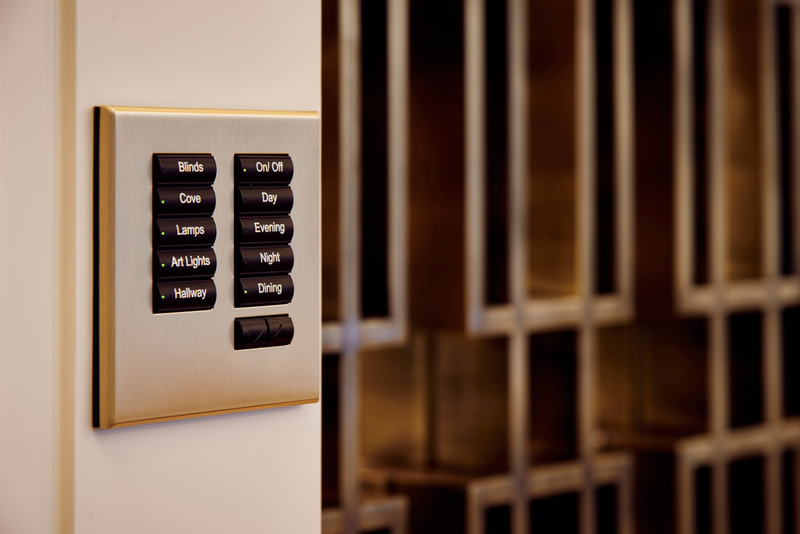 The space has been designed to please your senses and be efficient in use. Every centimetre has been utilised to best meet your needs, from hidden storage cupboards where you would think a solid wall lies to twin drawers of different depth within you dressing room. All has been thought of, from where you would want to place your accessories, your belts, your handbags or even your watch winders. Marble and Onyx were chosen to dress the bathrooms and water closet. Each slab was hand picked and bookmatched. Each one selected for its individuality, beautiful colours and reflection of light. 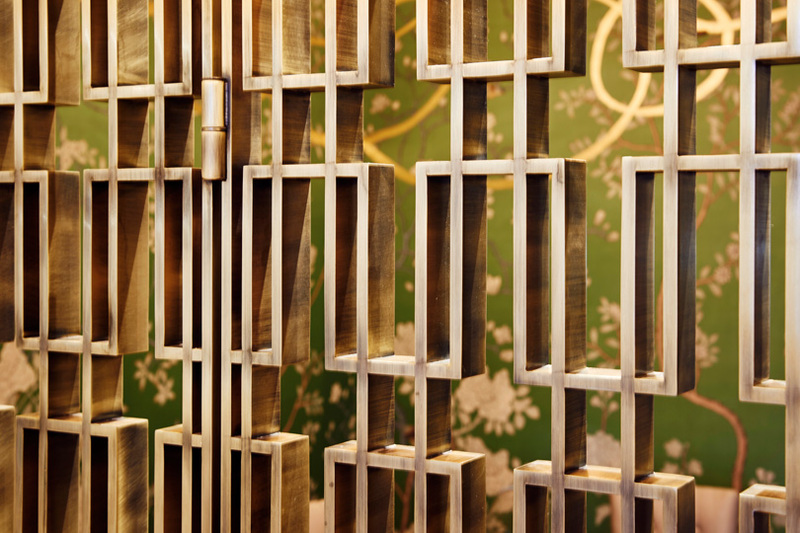 Carved and scalloped to follow the panelling design used around the apartment the materials invite your touch. 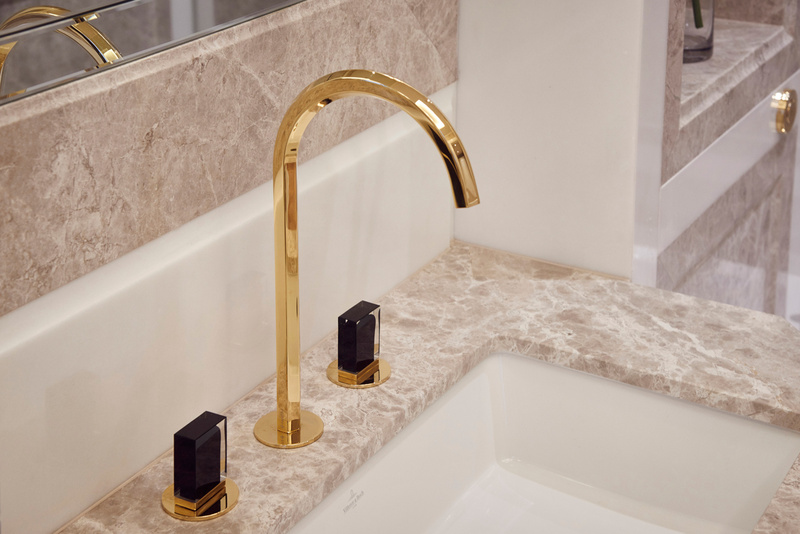 The master en suite has magnificent taps made of 24 carat gold and black hand painted glass from the island of Murano creating a timeless yet contemporary feel. 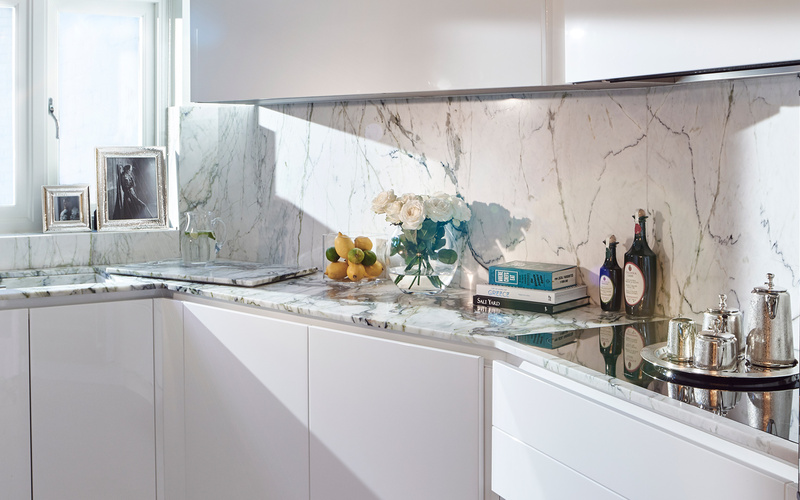 Green veined Calacatta marble dresses the worktop of the bespoke white lacquered kitchen. 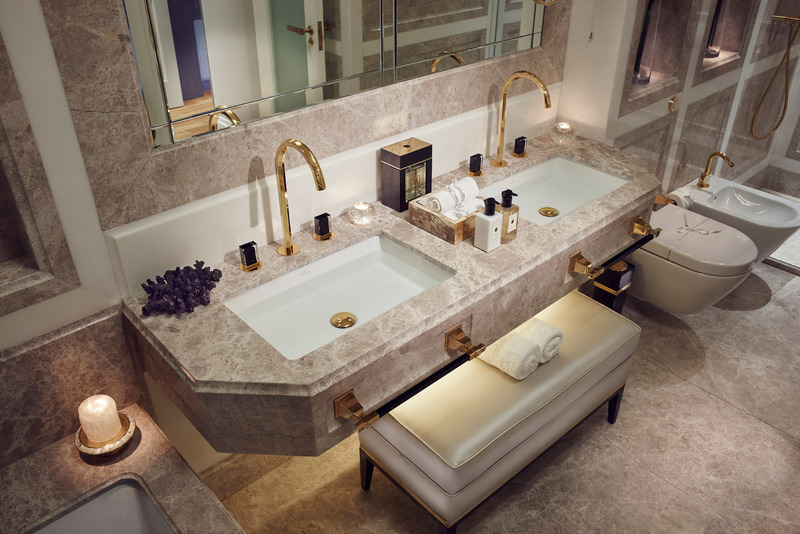 The sink was created using the same marble slab enabling it to be fully concealed on occasions when the kitchen becomes part of the entertaining area, offering a clean uninterrupted surface. 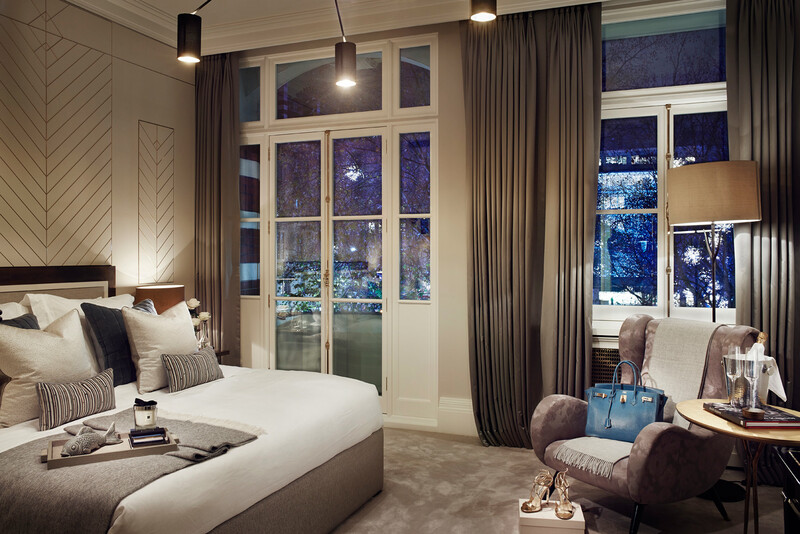 A three bedroom single level apartment that occupies the second floor of a period building on Sloane Square, with seven windows overlooking the square. The property features a lift, high ceilings, two balconies and boasts exceptional west facing views.